My sister is the frosting queen of Northwest Ohio. Her secret: Crisco. That may sound kind of repulsive to those who didn’t grow up with a can of Crisco on the counter like we did. To me, it sounds like a great way to add some density and texture to one of life’s small pleasures – frosting. Yep, frosting-love is a curse of the Steffens. I was home a few weeks ago and found myself spreading my sister’s frosting on some cheap shortbread cookies and it transformed each cookie into a religious experience. It reminded me of a food item I had about a month ago that did not need any transforming, but the frosting still really stood out. 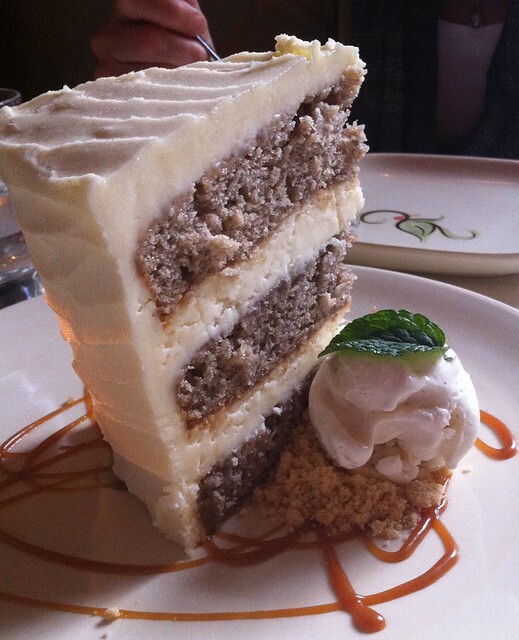 That’s it in the picture – Art Smith’s Hummingbird Cake from Table 52 (note to self, when cheap shortbread cookies and Crisco remind you of a masterpiece by Oprah’s former chef it could mean something is horribly wrong with your tastebuds). In the end, I went with the Hummingbird and I’m glad I did. Actually, I was glad for three days because it lasted three separate sittings and held up very well in the takeout container. Yes, that’s two sittings of just shoveling it in right from the takeout container after dinner. It’s kind of carrot-cakish but better. It has more brown notes, like a caramelish and brown sugar type of flavor. And despite the thickness of the frosting, it was light enough that it didn’t ruin the cake/frosting ratio and stood up to being hauled around in a takeout container and pawed at for three days. It just works and has completely changed my view of fruit in cakes. I was so smitten that I’ve started asking southern folk about the Hummingbird Cake in my efforts to bond with them using something other than college football. Here’s the thing though, I’ve asked no less than four people from Georgia and South Carolina and they look at me like I’m nuts. I don’t get it, if you Google this thing Paula Deen is all over it. Oh well, maybe it’s not as southern as I thought. This makes me wonder if I’m tapped in to food from my region. If you ask me about deep dish pizza, hotdogs, cherry pie, and Italian beef, I’m going to have something to say. I guess I can’t think of anything else really. There are probably a whole host of things that people identify as midwest/Chicago food that would make me say, “Huh?” Test me. Oh well, it was a great cake. Posted in food on 2012/05/11 by John.